What’s new about this program? The Safeguard School Program promotes handwashing awareness and brings about habit change at the grassroots level in Pakistan by becoming an ally in empowering children with health and hygiene education. The program has its roots in the Karachi Soap Health Study (2002) led by the Centers for Disease Control, HOPE and Procter & Gamble. The study showed that regular handwashing with soap can reduce the incidence of diarrhea by up to 50 percent. In Pakistan, where every year more than 250,000 children die from diarrhea, this message of handwashing becomes a message for survival. infectious diseases prevention in Pakistan. These credentialing partners help Safeguard in recruiting and training doctors and preparing tutorial material communicated in schools. covered more than 10,000 schools in 100 cities of Pakistan. 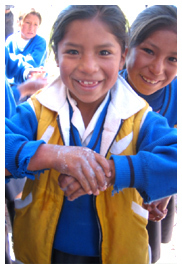 innovative ways to influence hand wash behavior change. Commander Safeguard animated cartoon. Each student is then given take-home educational material so that they can continue to learn and monitor their hygiene habits with their families. them drama competitions, debates, singing competitions, art galleries, health awareness walks, and community cleanliness drives – all organized around the theme of health and hygiene..